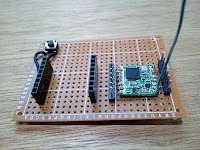 As i like doing some projects with IoT i also wanted to experiment with LoRa. 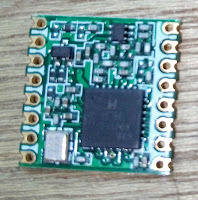 Some time ago i ordered a cheap LoRa shield for my Arduino. Unfortunate i did not get it working. 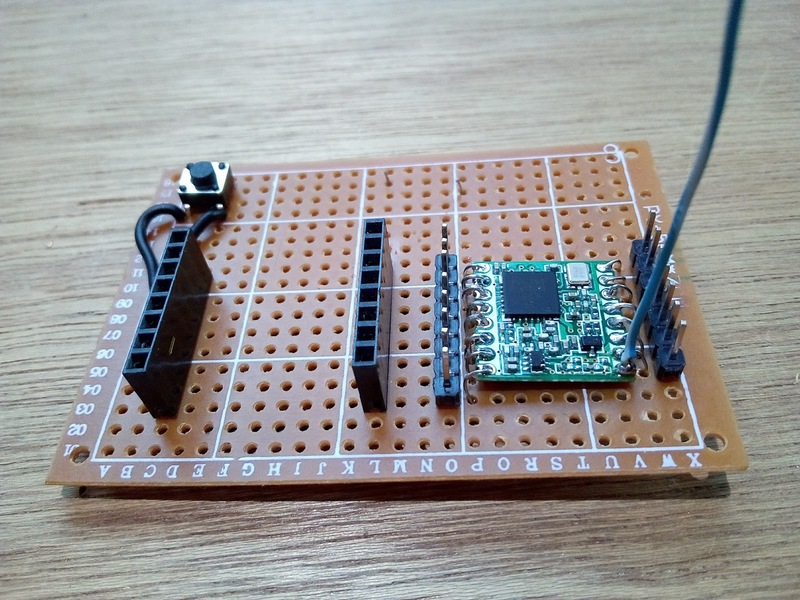 I could not find out if it was something with the code, the jumper settings, a hardware error or perhaps my shield could not reach a LoRa gateway in Almere. 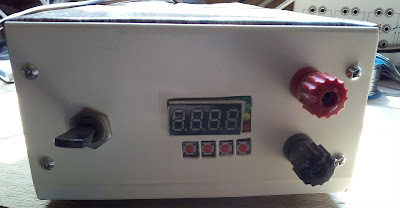 Perhaps in another LoRa post in my blog you will read more about this shield. 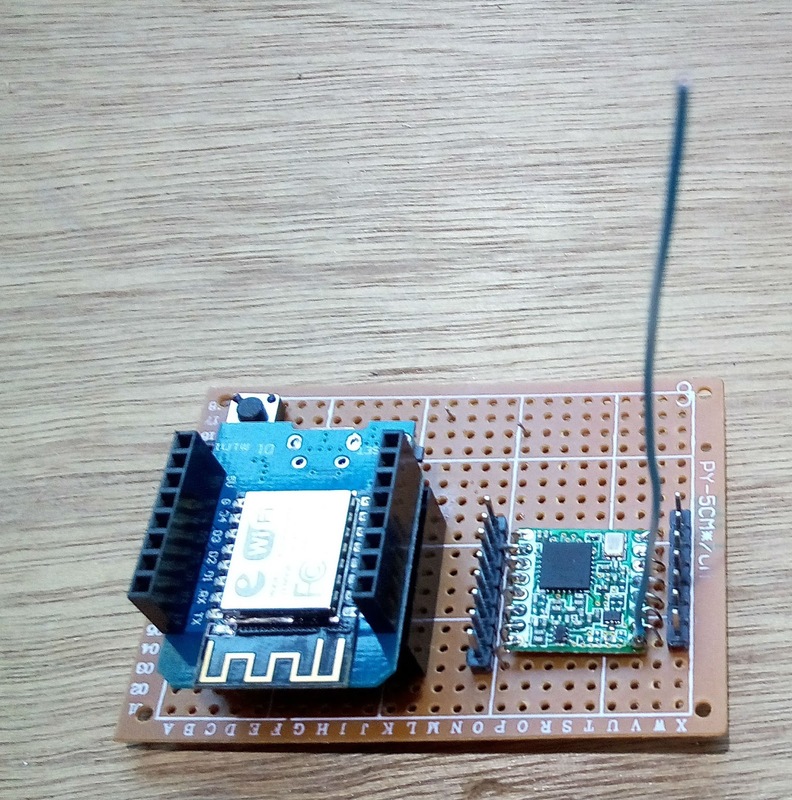 When asking advice someone was so friendly to send me documentation to make a simple one channel test LoRa gateway with an RFM95 and a Wemos D1 mini. 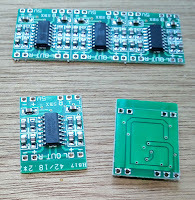 On Aliexpress i found two RFM95 breakout boards for 13 Euro so i decided to order them. 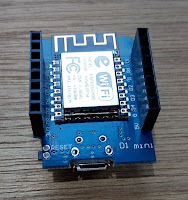 I have done several experiments and projects with different ESP8266 boards but until now i never used the Wemos version. 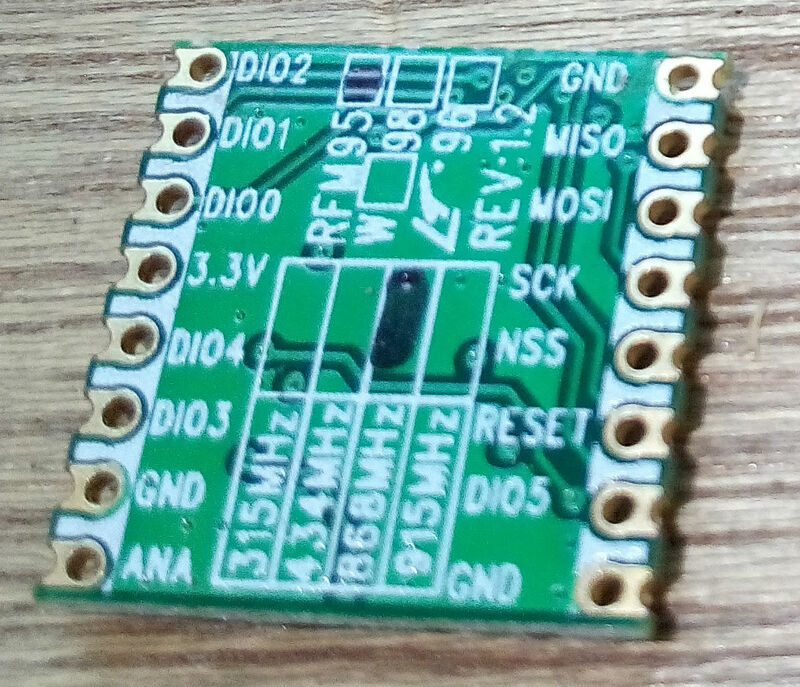 Between the RFM95 and the Wemos D1 mini (ESP8266) you need to make the some connections. 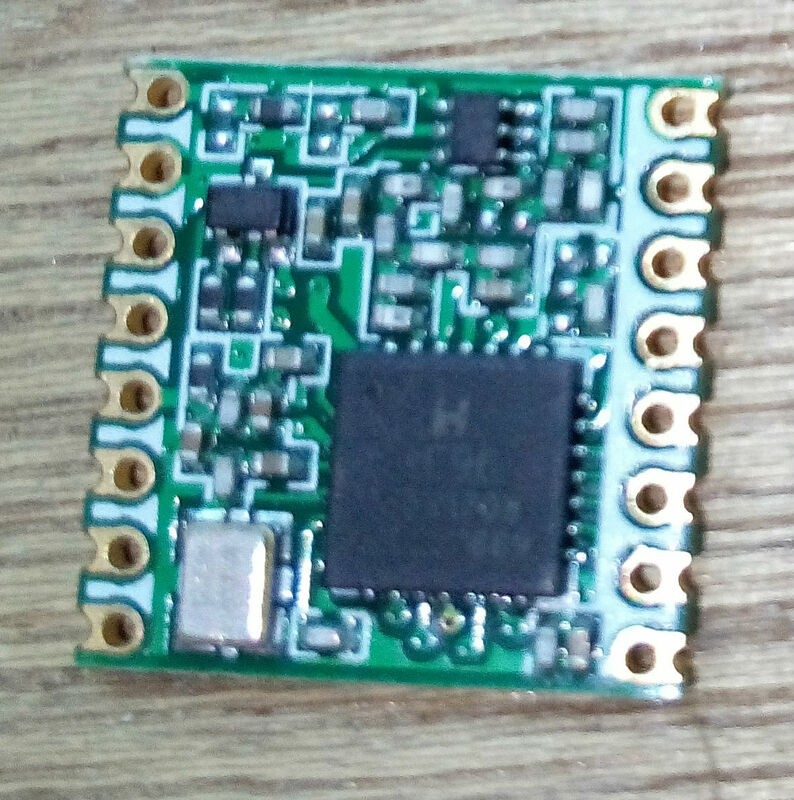 I decided to solder the female with long male pins on the Wemos D1 mini. 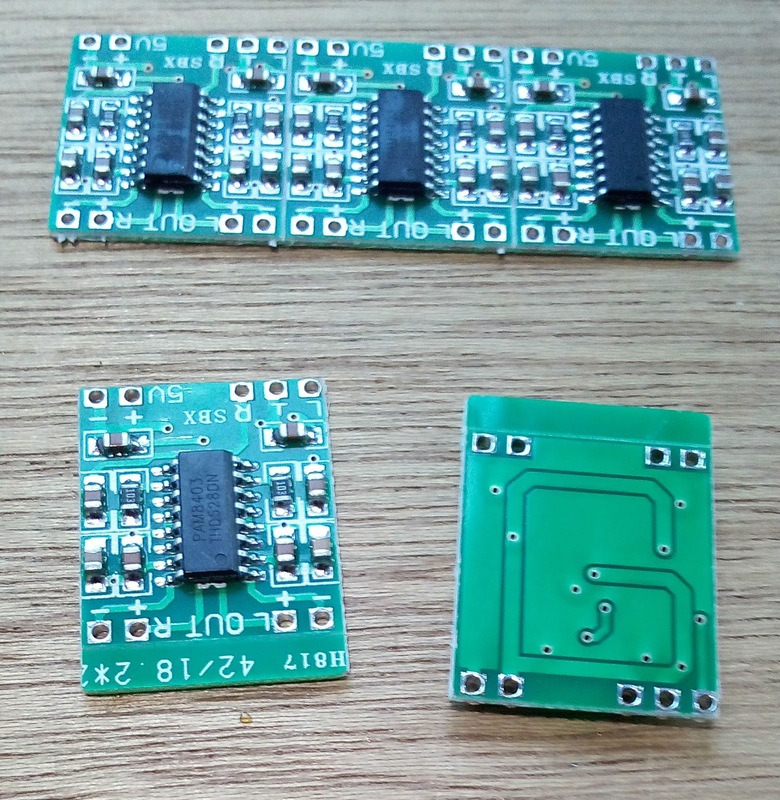 On the PCB i soldered the two sets of female pins so i could separate the ESP8266 from the circuit if needed. 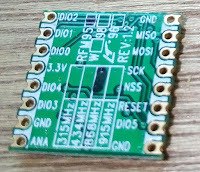 As the Wemos can be put in two ways in the connector of the PCB i marked the side of the Antenna. 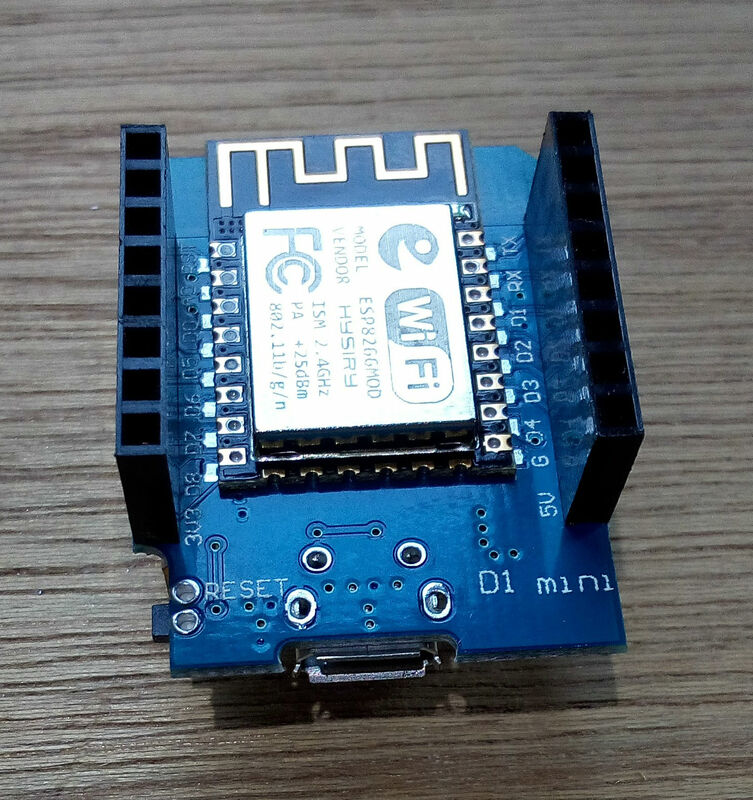 The Wemos D1 mini already has a Reset button. 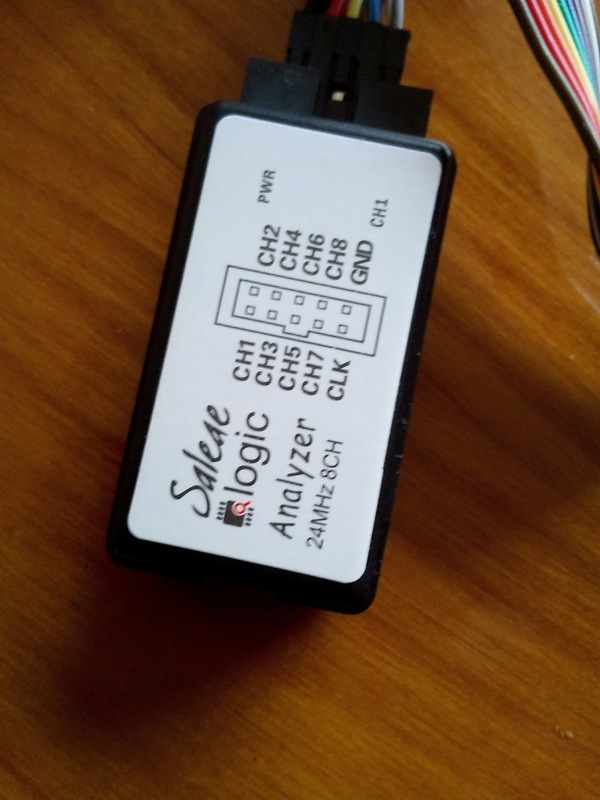 I tried to connect the Wemos to my computer using USB. At first it did not work as i used an USB power cable instead of an USB data cable. (I think i need to label my USB cables!). After finding the right cable i tried to upload the Blinck sketch first to test the connection and the Wemos module. In the directory ' Users\<MyName>\Arduino15\packages\esp8266\hardware\esp8266 ' i needed to manual clean up old software. So i removed there everything and Blinck worked. Now the 1ch Wemos gateway software. When installing this on my computer "Time" was already installed on my computer. As i did not know if this was the right version i decided to rename the old version. Stupid as this did not work. When starting the Arduino software to upload it to my Wemos i got an error message that there where two versions of "Time" with a link to my renamed version. So i moved my old "Time" version to another directory and this problem was solved. 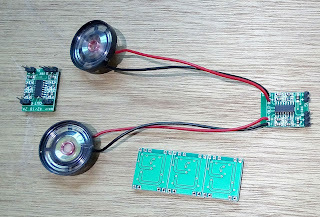 Now i got the error message "Documents\Arduino\ESP-sc-gway30\ESP-sc-gway30.ino:67:92: fatal error: gBase64.h: No such file or directory"
Googled and installed another "base64" but this did not solve my problem. Finally i found the latest 1ch gateway software ( Version 4. ) . This package included gbase64 and after adapting the configuration parameters it worked. The error message "The management functions only work over _THINGPORT and not over _TTNPORT" also went away by adapting the parameters. In my waste i found an old USB power connector cable. The connection cables (2 cables) where very short but still could soldered. 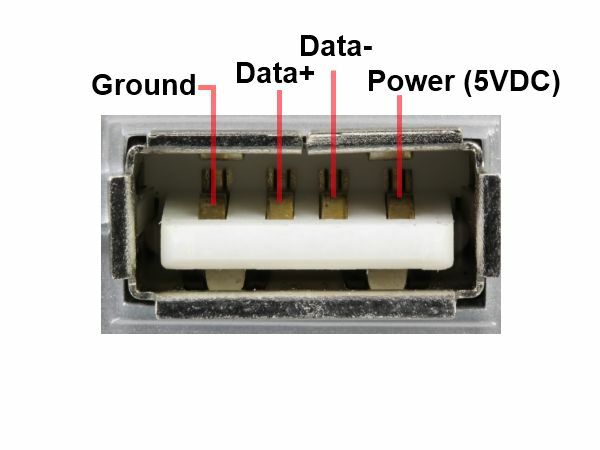 You can find more and more devices using an USB powered cable. 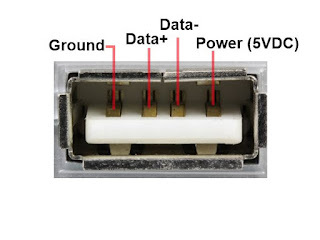 I expected the USB connector could be used to make a power cable (e.g. to connect to my regulated power supply from a previous post. With my multi-meter i checked the connections to find out which of the two wires is the power + and which is the ground - wire. 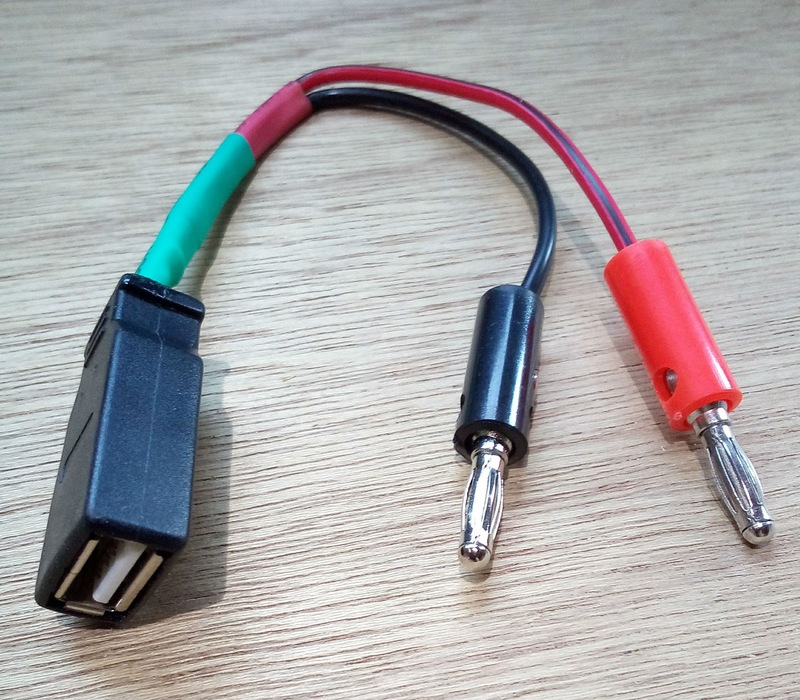 I soldered two wires (Red to power + and black to ground - ) to the connector and used heat shrink tube to insulate the wire. Each wire is insulated separate and after this heat shrink is for botch wires. On the other side of the cable i added two banana plugs. After checking the connections and checking for possible shortcuts with this my multimeter the USB power adapter cable was ready. 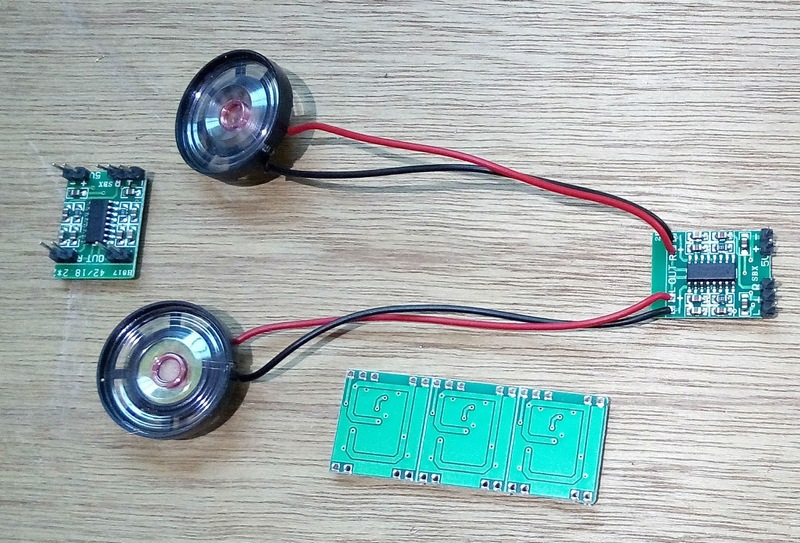 To use it with a (B3603) regulated power supply set the voltage to +5V and a (protective) limited max current. I am very happy with this USB adapter. Perhaps when i will make a new lab power supply i will include a fixed 5V output with USB connector. ( Current price 4,22 euro (June 2017) , In March 2017 i payed 4,43 ). Plugging it in my computer i noticed two leds (red PWR and green CH1 ) and my computer detected an unknown USB device. I had downloaded the latest version Logic+Setup+1.2.14.exe This program did not work for me! I fired up the program in Windows Vista and nothing seems to happen. (Perhaps to the old Windows Vista version). a nice program usable with my logic analyzer. On my device is printed CH1 to CH8 The software interface is mentioning Channel 0 to 7. CH1 is Channel 0, CH2 is Channel 1 and so on. This gave my first interesting signal(s) to look at ! 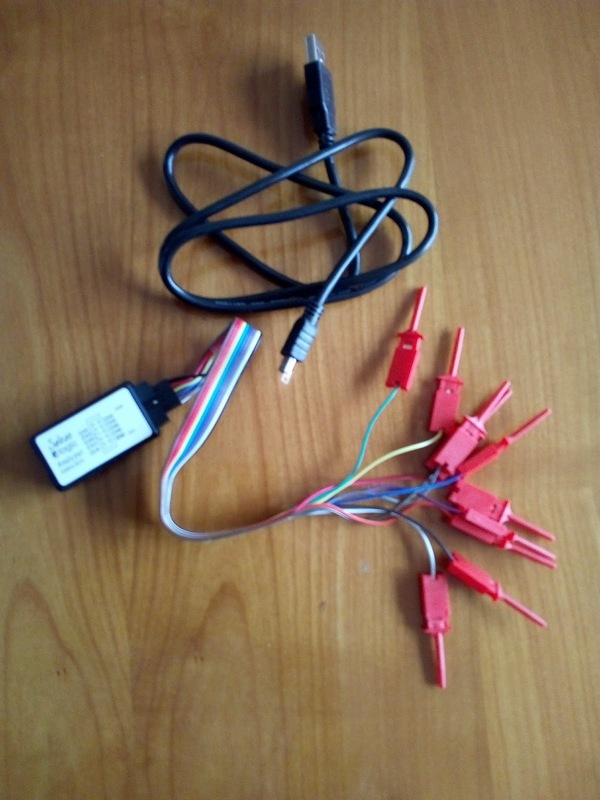 Later i discovered that, with the USB logic analyzer disconnected the software capture does a simulated capture and also gives an interesting ("test") signal. The software does not only visualize the signal but has also interesting features to measure, analyze and decode signals. Conclusion i finally have added an interesting device to my toolbox that i should have added earlier ! 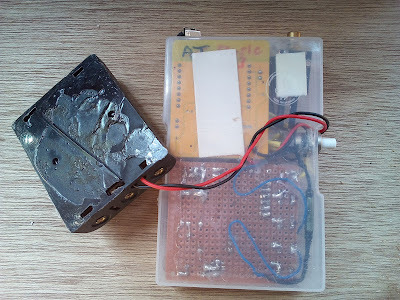 A i needed to repair my ESP8266 Wifi IOT laser presenter . I glued it again with hot glue. Hope this time it will last longer ! !